Links between corruption and illegal practices within fisheries are recognised in existing literature but little reference has been made to how these interconnected practices affect the performance and legitimacy of fisheries co-management. Research in the three countries bordering Lake Victoria, Kenya, Tanzania and Uganda, demonstrated that corruption is systemic and that members of all stakeholder groups – fishers, fisheries officers, police and the judiciary - are implicated. It was confirmed that corruption is strongly linked to illegalities and that corruption in this context should be viewed as a collection action problem, with fishers reluctant to invest in legal gears and methods when they perceive illegalities and corruption to be prevalent. It was also found that corrupt practices linked to illegalities discourages local level fisheries management structures – the Beach Management Units – from enforcing regulations and contributes to a lack of trust between fishers and government. Linked corruption and illegal fisheries practices were therefore found to be undermining the performance and legitimacy of co-management. The article concludes that whilst co-management offers opportunities for collusive corruption through collaborative arrangements, any management system will be susceptible to the harmful effects of corruption where it is systemic and is not formally recognised or appropriately addressed. Greater official recognition of the links between corruption and illegalities, and a range of appropriate actions taken to this collective action problem, is essential if co-management is to have a chance of success. The adoption of a co-management approach in fisheries often stems from a desire to improve compliance with regulations, driven in part by a belief that bringing resource users into management will incentivise compliance (Jentoft 2000; Evans et al. 2011; Cinner and Huchery 2014). Yet, the ability of co-management to deliver on improved compliance has not been unequivocally demonstrated (Cinner and Huchery 2014). Efforts to understand why this is may draw on research into the prevalence of illegalities, which has focused on the motivations of fishers to comply or not comply, identifying a range of economic and social/moral motivations (Kuperan and Sutinen 1998; Raakjær Nielsen 2003; Gezelius and Hauck 2011). Corruption, through the payment of bribes to avoid sanctions and to enable illegal practices to continue, has been shown to also be a factor in weak enforcement and non-compliance (Gezelius and Hauck 2011; Sundström 2016). To date, though, there is limited evidence available on how corruption associated with fishing illegalities affects governance systems. Literature on fisheries co-management specifically is almost silent on the issue of corruption. Broadly understood as ‘an arrangement where responsibility for resource management is shared between the government and user groups’ (Sen and Raakjær Nielsen 1996, 406), research has identified factors that influence the potential for success in co-management as including the nature and performance of leadership, having legal mandate in place and delivering effective community training and empowerment (Pomeroy et al. 2001; Napier et al. 2005). Referring to a broader range of resources and settings, literature on governing common pool resources has also identified a wealth of factors needed for success (Agrawal 2003). There is little literature, however, that specifically identifies factors that undermine or lead to the failure of co-management, though literature on success factors implies that the absence of such conditions threatens success. This paper examines how governance systems, in particular co-management, may be affected by corruption linked to illegal practices and seeks to answer the following overarching question: how does corruption linked to fisheries illegalities affect the performance and legitimacy of fisheries co-management? This is of critical concern to the inland fishery of Lake Victoria, East Africa. Illegalities are believed to be highly prevalent on the lake and this prevalence is one of several challenges identified by the lake management authority as a threat to the sustainability of the fisheries (LVFO 2015a, 2016). This is particularly the case for the highly valuable Nile perch fishery, of which stocks are believed to have depleted since the early 2000s, leading to the development of a ‘Nile perch recovery plan’ (LVFO 2015a). The lake is the second largest freshwater body in the world, covering 68,800 km2, with around 1500 landing sites and 200,000 fishers (LVFO 2015b), and is bordered by Kenya, Tanzania and Uganda. Co-management was introduced to the lake from the late 1990s through the formation of community-based structures known as Beach Management Units (BMUs). Co-management has not, however, been seen to have led to a reduction in illegalities or to greater sustainability of fish stocks (Mkumbo and Marshall 2015; Etiegni et al. 2017). In addition, payment of bribes to avoid arrest or fines when caught undertaking illegalities has been consistently reported, both before and since the introduction of co-management (Geheb 1997; Allison 2003; Eggert and Lokina 2010; Etiegni et al. 2017). Despite this, there has been no official recognition of any connection between corruption and illegalities, with fisheries management plans identifying illegalities as a challenge but silent on the subject of corruption, and no recognition that corruption may affect the performance of BMUs and the wider co-management system. Further rationale for focusing on the case of Lake Victoria comes from the ranking of the countries bordering the lake in the Corruption Perceptions Index of Transparency International. Tanzania, Kenya and Uganda are ranked 117, 139 and 139 respectively out of 168 countries (Transparency International 2016), suggesting that relative to many other countries, corruption is perceived to be significant in the public sector of these three East African countries. This is supported by a bribery survey in East Africa, in which the majority of respondents in Kenya, Tanzania and Uganda described the level of corruption as high and reported that it had increased in the previous year (Transparency International-Kenya 2014). Respondents reported that bribes were largely paid to speed up access to services, secure access to services or to avoid problems with officials. Police services were cited across East Africa as being most likely to ask for a bribe. Further, corruption has been reported as being ‘embedded’ or ‘institutionalised’ in these countries (Hope 2014; Muhumuza 2016), making it hard to avoid and to address. These sources suggest that corruption may be expected to occur within the fisheries sector, reflecting the situation within wider society. This article builds on and contributes to two areas of literature: corruption and illegalities in small-scale fisheries, and legitimacy and fisheries co-management. The contribution to literature on corruption and illegalities in small-scale fisheries is seen in the evidence of the scale and diversity of actors involved in petty corruption within the inland fisheries of Lake Victoria. Previous research (for example Sundström 2015) focused on inspectors tasked with enforcing fisheries regulations, but this research shows how BMU Committee members, the police, judiciary and local politicians are also involved. This finding demonstrates the systemic and collective action nature of corruption in small-scale fisheries. The contribution to literature on legitimacy and co-management is twofold. Firstly, the research provides evidence of how co-management is undermined by the lack of genuine enforcement, which is not just due to lack of capacity but to the desire to gain financially by those tasked with enforcement. The evidence also shows that co-management is undermined by the lack of incentives for BMUs to take enforcement seriously when corruption linked to illegalities is endemic. Secondly, the research demonstrates that undermining of the performance of co-management undermines its legitimacy, by leading to questions about the ability of BMUs to play an effective role in fisheries management and from the eroded trust between fishers and authorities (fisheries staff, police, judiciary and local politicians). The article therefore concludes that the prevalence of corruption and its intrinsic link to illegalities has the potential to undermine the performance and legitimacy of co-management. The article begins by a review of literature on compliance, corruption and legitimacy in fisheries, which guided data analysis and answering the research question. A section on methods sets out how the data collection and analysis were conducted and is followed by the findings. A discussion section relates the findings to existing literature and answers the research question, followed by a conclusion that emphasises the critical challenge posed by the entrenched link between corruption and illegalities for fisheries management. Literature on compliance with fisheries regulations primarily focuses on identifying motivating factors for non-compliance, clustering factors into two categories: rationalist and normative (Kuperan and Sutinen 1998; Raakjær Nielsen 2003; Hauck 2008). The rationalist perspective views fisherfolk as making rational decisions based on the costs and benefits of undertaking certain activities, bearing in mind the perceived likelihood of being caught and the likely sanction. A normative perspective investigates how compliance is influenced by norms, morality, perceived legitimacy of regulations and systems, and other social and cultural influences. Such perspectives are not incompatible and both have been drawn on to investigate and explain behaviour within fisheries (Kuperan and Sutinen 1998; Gezelius and Hauck 2011). Within this literature, there is some recognition of the role of corruption in weak enforcement and motivating non-compliance (see, for example, Kuperan and Sutinen 1998; Gezelius and Hauck 2011; Pomeroy et al. 2015; Sundström 2016), but overall this literature says little about the extent and effect of corrupt behaviour on the effectiveness of enforcement or the desire to comply with regulations (Sundström 2012). Nøstbakken (2008, 299), for example, notes that ‘little work has been done when it comes to including corruption and bribery into formal models of compliance in fisheries’. Corruption linked to illegalities within fisheries has been shown to include at least three practices: inspectors carry out inadequate enforcement, share details of enforcement operations with fishers to give advanced warning and participate themselves in illegal fisheries (Sundström 2015). Such practices imply that trust and social ties between fishers and inspectors facilitate bribes in exchange for non-enforcement of rules and legislation (Sundström 2013). Yet corruption also leads to reduced trust between fishers and government officers, as the trust of some fishers in government officers reduces as they see officers demand and/or accept bribes (Sundström 2013), with implications for the effectiveness and legitimacy of fisheries management. The willingness of government officers tasked with enforcement to engage in corruption has been attributed to the desire to supplement meagre salaries (Medard et al. 2016; Etiegni et al. 2017), as well as to the allocation of insufficient resources for enforcement and politicians interfering in fisheries management, not wanting their potential voters to be sanctioned (Pomeroy et al. 2015). The nature of corrupt practices linked to fisheries enforcement suggests that this is ‘petty corruption’, as opposed to grand corruption, involving collusion and ‘bribes to enforcement officials to evade sanctions’ (Sundström 2016, 73). Corruption has also been perceived to result from imbalances of power between actors (Anders and Nuijten 2007; Williams and Le Billon 2017), leading to corruption being ‘embedded in the wider matrix of power relations in society’ (Anders and Nuijten 2007, 2). In the context of fisheries, government officers, including the police, are more able to demand bribes from fishers, particularly from poorer fishers, who have little power to resist and want to avoid going to court (Medard et al. 2016). Willingness to comply by fisherfolk is strongly affected by perceptions of legitimacy of regulations and of management systems and structures (Jentoft 2000; Raakjær Nielsen 2003). Legitimacy of fisheries management is expected to increase through the participation of fishers in co-management, which is in turn ‘assumed to result in a higher degree of compliance’ (Jentoft 2000, 145). Legitimacy stems from the legal mandate underpinning authority, systems and measures, yet it also depends on acceptance of these and acceptance of the processes that led to such legal mandate and the nature of the systems and measures by stakeholders (Sandström et al. 2014). Jentoft (2000, 145) further explains the link between legitimacy, compliance and fisheries management through observing ‘typically, a management system is expected to sustain fish stocks and at the same time respect the norms of equity, fairness, and trust that reside within user-communities. When a system is found to fulfil these qualities and thus obtains the status of legitimacy from the perspective on the users, a moral obligation to adhere to the rules rest on the user’. From this review of literature, it can be seen that corruption has been established as a factor that encourages non-compliance, is manifested in a range of practices by government officers tasked with enforcement and reflects relations of power within society. The extent of compliance is also influenced by perceptions of legitimacy of rules and management systems. The data was generated through 133 qualitative interviews conducted with a sample of actors from key occupational and other stakeholder groups within Lake Victoria fisheries, as shown in Table 1. Qualitative interviews were considered appropriate for generating data to answer the research question as they generate rich, in-depth responses on individual experiences and perceptions (Punch 2014). A case study was used, of Lake Victoria fisheries, as a case study allows deep investigation whilst recognizing the specific context and complexity of the case (Yin 2014). Characteristics of the case of Lake Victoria articulated earlier – of limited capacity for enforcement, perception of high prevalence of illegalities and situated in a broader context of established concern about high levels of corruption in public service – suggest that this is a suitable case for the research question posed. The fieldwork was carried out between April and June 2015 at a sample of 18 fish landing sites chosen to reflect a diversity of fisheries communities according to island and mainland landing sites, number of boats and main target fish species. The fieldwork was carried out by researchers from the fisheries research institutes in the region, with interviews undertaken in the appropriate local language. These researchers are co-authors of this paper, with the first and second authors leading the design of the research and data analysis, and also participating in the piloting and some data collection. The researchers from the national fisheries research institutes have many years experience in the lake region and are known and trusted by fishing communities. This facilitated access to the communities and to the fisheries officers. There was no evidence of an unwillingness to respond to the questions due to the position of the research staff, though the number of interviews conducted assists in establishing the reliability of the data. The sampling approach involved a mix of purposive sampling (for the fisheries staff and BMU leaders) and convenience sampling within a stratified sampling approach for the occupation-based respondents. Members of the BMU Committee assisted in identifying and approaching potential respondents present at the beach, based on their local knowledge; their involvement may have introduced bias into the sample selected, but such potential bias is mitigated by comparing data across landing sites and triangulating between interviews. The research project from which this data and analysis comes sought to investigate personal networks and experiences and perspectives on co-management. The semi-structured interviews with boat owners, boat crew and fish traders/processors had five sections: knowledge of BMU structures, activities and performance; compliance and legitimacy; social groupings; occupation, wellbeing and trust; and, future plans, informed by knowledge of, and attitudes to, the condition of the fisheries. This paper draws mainly on the section on ‘compliance and legitimacy’ and to a more limited extent on the interviews with BMU leaders and fisheries staff, which focused on their work and experiences of co-management. Respondents were not asked about corruption; data on experience of and perspectives on corruption emerged from the interviews. The questions instead asked about the experience of respondents of illegal fishing, their perspectives on compliance around the lake and why people fish illegally, their knowledge and experience of the functioning of the BMUs and the nature and roles of a range of interpersonal relationships, between boat crew and boat owners, fishers and fish traders, and between fishing communities and fisheries officers and village local governments. The research did not seek in-depth data on the motivations and practices of corruption; such data would require an ethnographic approach. A grounded theory approach was taken to analyse the data on compliance, drawing on the intensive interviews which involved flexible questioning, responding to leads generated in responses. The analysis involved initial coding of data to categorize and summarize the data, from which more focused coding was conducted, prioritizing data according to themes and frequency of occurrence (Charmaz 2014). From this focused coding, several key themes associated with corruption and compliance emerged, leading to the structure of the findings as presented in the Results section. These findings are integrated with the reviewed literature to produce Figure 1, which illustrates relationships between corruption, compliance and co-management. Pre-testing of the interview guides took place during an all-team 5-day workshop in Tanzania, which involved discussion of the aims of the research and the draft interview guides. Informed verbal consent was sought from all respondents after the interviewer had fully explained the nature, consequences and potential risks of the research. Confidentiality and anonymity of the respondents is maintained by not recording the names of respondents in data storage and by not including the names of the landing sites, districts or countries in reporting. The data is presented mainly in the form of quotes, selected to represent the range of responses from each occupational group and, for each quote, the country and occupational group is given as the source, with a number assigned to each of the six landing sites sampled. The inclusion of quotes from a range of occupational groups and all countries shows a consistency in the findings. There were no clear differences between occupational groups or between countries. There were, of course, different experiences and views, but there was also a consistency in the data, which is reflected here. The country is not given for the fisheries staff (FS) due to the few staff working along the lakeshores and the need for anonymity. The occupation-based sample included 85 males and 19 female respondents, reflecting the male-dominated composition of Lake Victoria fisheries (LVFO, n.d.). There are three main commercial fisheries within Lake Victoria: Nile perch, Nile tilapia and Dagaa, a small sardine-like fish. Nile perch is the most important fishery in terms of economic value, with the fishery developed in the 1980s and 1990s, following the introduction of the fish to the lake in the 1950s. Fish processing plants and an associated supply chain facilitate export of the fish to the European Union and other parts of the world. However, the Nile perch fishery is perceived to have declined in terms of stock, catch size and size of the fish (LVFO 2015a). Over 95% of the catch comes from these three fisheries. The fisheries are described as small-scale and artisanal, meaning that the vessels used are relatively small and locally-made and that the fishing enterprises comprise of relatively low capital investments. They are therefore labour-intensive, with relationships between actors within the fish chains being critical for access to labour, employment and fish (Nunan et al. 2018). Development and enforcement of regulations is led in each country by the respective department or ministry of fisheries. Regulations aim to prevent the catching of juvenile fish, with minimum mesh and hook sizes and banning of indiscriminate fishing gears (beach seines, monofilament nets) and methods (for example trawling and tycooning). There are also protected breeding areas and a minimum and maximum size for Nile perch. Whilst relying on managing fishing effort is contested by some scientists, who argue for an ecosystem-based approach, informed by ecological change as well as fishing effort (Njiru et al. 2014), there is no evidence that the fisheries regulations are seen as illegitimate or controversial by the fishers themselves. On the contrary, evidence (see Cepić and Nunan 2017; Etiegni et al. 2017) shows that fishers accept the need for regulation and do not question the regulations themselves, though do question how they can abide by them given declining stocks and lack of alternative livelihoods. The three countries harmonize their approach to fisheries management through the Lake Victoria Fisheries Organization (LVFO), a structure of the East African Community. LVFO is served by a secretariat, which supports decision-making by committees formed by the fisheries departments and research institutes of each country, with the Council of Ministers being the highest-level decision-making body. Initiatives to improve enforcement of regulations include the development of the Regional Plan of Action on Illegal, Unreported and Unregulated Fishing (RPOA-IUU) in 2004. An assessment of MCS on the lake in 2011, however, found it to be ineffective (Kariuki 2012). Many reasons were put forward for the inadequate results from MCS, including the geography of the lake and lack of funding, but other factors have also been seen as important, including the lack of political will to enforce regulations, particularly around election times (Kariuki 2012; Kjær et al. 2012) and the payment of bribes to avoid sanctions for illegalities (Medard et al. 2016; Etiegni et al. 2017). Illegalities largely consist of the use of undersized gillnets (catching immature fish), use of illegal fishing gears (monofilament nets, which can easily get lost and be very destructive as a consequence, and beach seines) and use of illegal methods, such as cast fishing (Kariuki 2012). The extent of illegal fishing on the lake is hard to estimate. Kariuki (2012) drew on a range of evidence, including data from the biennial census on vessels and gears (frame surveys), data from enforcement activities and expert witnesses, to estimate that one in three fishers use illegal gears. Eggert and Lokina (2010) undertook a quantitative study to estimate the extent of illegal fishing in the Tanzanian portion of the lake and found that 47% reported alternative compliance and non-compliance behaviour and 8% were persistent violators. They calculated the overall violation rate to be 29%. Whilst then there can be no definitive estimation of the extent of illegalities, illegal practices are seen to be a factor in the demise of the Nile perch fishery. The Nile perch recovery plan for 2015–2019 refers to there being a ‘significant number of beach seines and monofilament nets’ (LVFO 2015a, 11) and to a ‘tremendous increase of illegal gears and practices, making the NP fishery more and more vulnerable’ (LVFO 2015a, 26). Factors believed to be driving non-compliance include the high cost of legal gears and fear of theft (Etiegni et al. 2011), poverty amongst fishers (Cepić and Nunan 2017), weak enforcement (Medard et al. 2016) and the perception of violation by other fishers (Eggert and Lokina 2010; Cepić and Nunan 2017). In the late 1990s and early 2000s, co-management was introduced to the lake, with support from two donor-funded projects addressing environmental and fisheries management. The second project supported a harmonized approach through the LVFO but, since the project ended in 2008, resources to support the further development of co-management have been limited. The initial lake-wide implementation of co-management included the formation of BMUs and the election and training of committee members. In addition to regular committee meetings, BMUs are required to hold assembly meetings, with everyone working within fisheries at a landing site encouraged to attend. BMUs are tasked with a range of roles including working with government fisheries officers in conducting patrols to enforce regulations, keeping a register of people working in fisheries at the beach, receiving newcomers, keeping the beach and areas where fish is handled and sold clean and planning for development and management activities. Networks of BMUs were formed soon after the BMUs were established and many still exist though are not very active as no funding has been allocated by government to support the networks and no other funding source has been secured. Government fisheries staff lead in fisheries planning, enforcement and quality assurance, and supervise the work of BMUs. The functioning of BMUs, particularly in the absence of ongoing technical and financial support, has been viewed as mixed, with some effective BMUs and others not functioning at all, or perceived as facilitating illegalities (Etiegni et al. 2017). The results are presented according to the themes that emerged from the analysis. Who is alleged to be involved in corrupt practices; why and how do corrupt practices take place? Fisheries management on Lake Victoria involves a wide range of actors. Led by the fisheries directorates of the three governments, these are represented by fisheries staff (fisheries officers and assistants) at decentralised levels of government. Fisheries assistants are stationed at some fish landing sites, whilst other landing sites are visited occasionally by fisheries staff. Police officers participate in fisheries management through being involved in occasional patrols (on land or water) and BMU Committee members undertake and participate in a range of fisheries management activities. In Uganda, a further group has been involved in enforcement. For many years, Special Enforcement Officers were deployed outside of the fisheries directorate but endorsed by the Minister of Fisheries to focus on enforcing regulations. When asked about their knowledge and experience of illegal fishing, around half of the boat owner and boat crew respondents, as shown in Table 2, referred to corruption when discussing illegal fishing. All groups involved in enforcement – BMU leaders, fisheries staff, police and the judiciary – were alleged by respondents of engaging in corrupt practices. Such practices include fisheries staff and police being offered, or requiring, a bribe to release seized illegal gears, and fisheries staff and BMU leaders taking regular bribes to allow illegal practices to go on. It was also alleged that fisheries staff sell-off the seized gears to make money. For example, a boat owner explained that ‘when enforcement agents confiscate illegal gears from fishermen they are bribed by the owners and sometimes sell them off to other fishermen from a different landing site’ (UGBO6) and a fish trader/processor observed that ‘even the fisheries officer who took us to court was suspended because of receiving bribes’ (UGFTP1). Perceptions on and experience of illegal fishing. Special enforcement officers were not given engines, food and boats so they have to gamble and get all. the above. So if he borrows fuel and goes to make patrols at the lake and does not come across any fisherman, then he gets anyone involved in illegalities, anyone whom he comes across whether he is involved in illegalities or not has to be made to pay a bribe in order for him to be able to pay the fuel that he has used (UGBC3). At times when you bring the exhibits to police, the police connive with those people and they bring old nets to replace the ones you have brought, because as soon as you bring those things to police, your work ends there and you can only follow up, and follow up, so whatever happens, you cannot do much (FS). The political leaders. When they are with us, say during our special meetings, they tell us please you control these illegalities. But when we come and enforce in the way we agreed, they always comment in a negative way. Say when the BMU chairman has burnt illegal gears today, they call them and they say, ‘No, no, no! Let me, I will talk to him’ (UGBMU). It depends on the landing site. If you find a landing site that has many illegal fishers, and where the BMU wants to eliminate those illegal fishers, you find them at loggerhead (…) Illegal fishers will always want to tarnish the image of the BMUs even if they are doing the right thing, and many times they have won them over (…) They have won the BMUs to their side. They give money, they give what … You find a BMU who was an excellent performer, this time he is compromised in one way or another (FS). Demands for bribes from enforcement officers were attributed to the opportunity to make money, particularly in the case of Special Enforcement Officers who were alleged not to be given resources to carry out their work. There were mixed responses regarding the willingness of boat owners, boat crew and fish traders/processors to offer or pay bribes. In some cases, fisherfolk were reluctant to pay a bribe but felt they had no choice if they wanted to be able to keep their gears and/or avoid court. Enforcement officers, particularly the police and judiciary, are more powerful than fisherfolk and may demand that a bribe is given; it was stated that there are times when informal payments are demanded even in the absence of illegalities. In other cases, it was reported that fisherfolk actively offer to pay bribes on a regular basis to enable them to continue using illegal gears. However, such practices may still reflect an imbalance in power relations as those with illegal gears lack alternatives but to pay a bribe to continue. This leads to the question of why such people fish illegally and how prevalent illegalities are. As reported in the Introduction, illegalities are perceived to be highly prevalent and are reported as such in the Fisheries Management Plan III (LVFO 2016) and the LVFO Nile Perch Fisheries Management Plan (LVFO 2015a). In the fieldwork, many respondents reported that they believe that illegalities are widespread, with this view being particularly prevalent amongst boat crew, as shown in Table 2. Drivers of non-compliance were reported as including poverty leading people to buy the cheaper illegal gears, with around half of boat owners and boat crew reporting this to be the case. Other reasons cited include the high incidence of gear theft on the water, making the purchase of the more expensive legal gear unattractive, and the smaller size and stocks of Nile perch meaning that smaller mesh size nets and smaller hooks were preferred so that smaller fish than that legally permitted could be caught. The perceived prevalence of illegalities was also reflected in the response to the question on the main threats to the lake fisheries, with many respondents stating illegal fishing to be the main threat, as shown in Table 2. Other threats cited included the increasing number of fishers and gears. How does corruption affect co-management systems and activities? The government official does not assist us. The government officials are corrupt. There is no transparency between the fishers and the government. Fishers using bad gears give corrupt money to the officials so that they can be favoured. The BMU officials may be strict with the use of bad gears but the government officials are not (KEBO3). In addition to BMUs being discouraged from enforcing regulations and their work being disrupted because of illegal and corrupt practices, respondents claimed that fisheries officers intervene in the election of BMU Committee members to get people onto the Committee that they can work with to maintain bribes: ‘The fisheries officers normally want people whom they can coordinate with, those who can collect for them bribes from illegal fishers’ (UGBC1). In addition, village leaders and members of village government were accused of being engaged in illegalities, undermining the work of BMUs. A boat crew observed that ‘some village leaders own illegal gears and therefore village government protect them and affects the function of BMU’ (TZBC2) and a fisheries officer that ‘the village leaders differ with BMU because they want to allow illegal fishers to fish while the BMU stops them. This results into enmity between the village leadership and BMU’ (FS). At the same time, the cases of rebel communities in which the illegal fishermen prevailed and won over the BMUs demonstrate that corruption among BMU leaders prevents enforcement of regulations. Corrupt BMU leaders block cooperation with fisheries staff while discouraging compliance and reporting of illegalities. Non-reporting of illegalities, however, is attributed to many factors, such as fear of revenge, feelings of obligation towards friends and family and moral support for fishers who use illegal methods to feed their families, but it can at least partly be explained by the perception of corruption among the BMU leaders, and other enforcement agents. As noted by one boat crew, ‘illegal fishers are known to village leaders and no actions have been taken, so why should I go to inform them’ (TZBC5). How does corruption impact on the legitimacy of co-management? Despite accusations of corrupt behaviour against some government fisheries officers, respondents were almost unanimous in their belief that government has the right to tell fishers how to fish. 88% of boat owners and fish traders/processors and 89% of boat crew agreed that government should set rules and regulations on fishing. A boat owner confirmed that ‘yes, without government it will be chaos because of illegal fishing like use of beach seines and monofilament nets. People will use the fishery resource irresponsibly and deplete’ (TZBO3). However, some also observed that such a right had been undermined by corruption, with one boat crew commenting that ‘yes, government has the right to do so, but corruption has made the government fail to protect our fisheries resources’ (TZBC6). Some respondents felt that the low level of fines for infringements suggested that the government was not really serious about enforcement, with a boat crew observing that ‘even the fines charged for involvement in illegal fishing are little so we think government is not serious’ (UGBC3). However, others thought that the experience of being fined, including the level of the fine, did encourage change in behaviour, as the continuous process of being caught and having to pay bribes can, in itself, be a deterrent as it becomes expensive and tiresome over time. One boat owner reported that ‘in 2014 enforcement officers found my crews with a beach seine and took them to court after I had refused to pay them a bribe of 1,200,000 Ugandan shillings. My crews were prosecuted and I was charged a fine of 500,000 Ugandan shillings, since then I resorted to legal fishing’ (UGBO4) and a fish trader/processor also suggested a change in practice, ‘yes, once I was caught with small fish and sent to court. After that I stopped to process small fish because I lost my time and money’ (TZFTP1). Furthermore, it was generally reported that very few cases go to court, and these cases often involved poorer members of the fisherfolk with insufficient funds to pay the bribe. One boat owner reported that ‘a few cases are taken to court. Some are solved in the office of the BMU chairman and others are solved at the shorelines by paying bribes to the enforcement officers. Those ones sometimes fail to pay bribes to the enforcement officers and it is the boat crews that are normally taken to court because they don’t have money to pay the enforcement officers’ (UGBO3). The research found strong evidence that efficient and consistent enforcement leads to the curbing of illegalities, but it also established that among the respondents very few people who used illegal gears were in the end prosecuted and punished. The low fines and the inconsistent use of fines and court appearances undermine the legitimacy of the fisheries management system in place. The article sought to answer the research question ‘how does corruption linked to illegalities affect the performance and legitimacy of fisheries co-management?’. From the findings, it was confirmed that corruption takes place and appears to be endemic within the fisheries of Lake Victoria, reflecting perceptions of high levels of corruption within public services more generally in East Africa (Transparency International-Kenya 2014) and the reported embedded or institutionalised nature of corruption (Hope 2014; Muhumuza 2016). Not only is corruption endemic in the fisheries sector, it is strongly connected to illegalities. Corruption provides a way for fishers to sustain illegalities and avoid penalties and imprisonment, and, in turn, illegalities provide opportunities for many stakeholders to gain financially. The endemic nature of corrupt behaviour suggests that the practice can be viewed as a ‘collective action’ problem, explained as: ‘if you expect others in your community to be corrupt, you will be incentivized to act corruptly because the individual costs of engagement in principled behaviors outweigh the individual benefits’ (Carson and Prado 2016, 58). Stakeholders believe fisheries illegalities and corruption to be widespread, disincentivising the adoption of legal fishing practices and the avoidance of corruption. In contrast to other literature, where the focus was on specific stakeholder groups, such as government officers (inspectors) in South Africa (Sundström 2013) and BMU and fisheries officers in Kenya (Etiegni et al. 2017), it was found that members of all stakeholder groups – fisheries staff, BMU Committee members, police and the judiciary – are implicated in corruption, with local politicians also involved by stopping enforcement to secure votes during election periods. The Special Enforcement Unit in Uganda formed by the Secretary of State for Fisheries outside of the fisheries directorate was particularly lambasted by fisherfolk and fisheries staff, who accused them of seizing legal as well as illegal gears and demanding bribes for their return. The introduction of the Special Enforcement Unit, using security personnel from outside of the fisheries department, reflects the power of the Minister, though their motivation, beyond espoused removal of illegalities, is unclear. The link between corruption and illegalities falls within both rationalist and normative perspectives on compliance. Fisherfolk are likely to assess the potential of being caught and the cost of the bribe versus a fine, factoring in the loss of gear and days fishing or trading as appropriate, taking a rationalist perspective. However, the perpetuation of corruption and illegalities is facilitated by social and power relations, with compliance behaviour explained by a normative perspective. Trust between those engaged in illegal practices and enforcing officers is established over time, reflecting Sundström’s (2013) observations of relations of trust enabling corruption and illegalities in South African fisheries. Fisherfolk were clear in their view that the corrupt practices of government officers were undermining the work of the BMUs. It was expressed that the fisherfolk could not trust government officials because regulations were not being enforced, at least not consistently. Such a lack of trust and a demonstrable lack of commitment to enforcement by some government officials undermine the legitimacy of fisheries management. The undermining of BMUs through fisheries officers interfering in committee elections to get certain people in place and by allowing illegalities in exchange for bribes limits the scope for BMUs to take action to improve compliance with regulations. The prevalence of systemic corruption erodes trust in the system and in the willingness of government to take fisheries management seriously. This implies that co-management is being undermined by the behaviour of some fisheries officers and other actors. This is of concern for research and practice as the undermining of the legitimacy and performance of co-management has not, to our knowledge, been widely researched or recognised. The inference that corruption and illegalities are undermining the legitimacy of co-management confirm Lawrence’s (2013) observations from research on Lake Victoria in Uganda where he found that the legitimacy of the BMUs was undermined by the involvement of agencies (police and army personnel) in fisheries enforcement and by corrupt relationships between BMUs and Fisheries Officers. Lawrence (2013, 186) reported that ‘the BMUs were given authority, but intervention by police and army personnel confuse and delegitimize that authority’ and that BMU Committee members complained that ‘actions taken from higher political levels delegitimized their efforts to control illegal fishing, collect taxes, or have any influence over fishing activities in general’. It is evident then that co-management of Lake Victoria fisheries is being undermined, evidenced by BMUs being unwilling to enforce regulations because of the corrupt practices of fisheries staff and police; by some fisheries staff and fishing communities actively seeking and enabling fisherfolk who are willing to facilitate illegalities through the payment of bribes to be elected to BMU Committees; and, by politicians interfering in the work of fisheries officers and BMUs by stopping sanctions and intervening in BMU Committee elections. 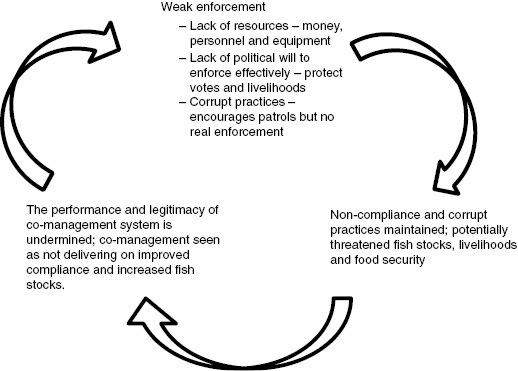 Figure 1 illustrates these relationships by showing how weak enforcement, resulting from limited resources, political factors and corruption, leads to illegalities and further corruption, and potentially to threatened fish stocks, livelihoods and food security, in turn undermining the performance and legitimacy of co-management and to further weakening of enforcement. From the evidence above, it can be concluded that the scale and entrenched nature of the illegalities-corruption linkage undermines fisheries co-management. This undermining is fuelled by the lack of genuine enforcement by authorities and the lack of incentives for BMUs to take enforcement seriously due to the prevalence of corruption. The legitimacy of co-management is in turn undermined by the perceived inadequate performance of co-management and by eroded trust between fishers and authorities (fisheries staff, police, judiciary and local politicians). The scale of corrupt practices linked to illegalities is demonstrated through the involvement of actors from all stakeholder groups and by the consistent reference to these practices when respondents were asked about their experience of illegalities and enforcement. There are divergent views that could be taken on the undermining of co-management by corruption and illegalities. It could be concluded that the very nature of co-management is conducive to systemic corruption. The formation of committees at the beach level, with power to contribute to decisions on vessel licensing and to enforce regulations with fisheries officers, opens up opportunities for bribes to be offered and sought. This view is supported by Etiegni et al. (2017), for example, who call for the design of co-management on Lake Victoria to be reconsidered in response to the constraints on BMUs in enforcing regulations due to social ties and the prevalence of corruption. An alternative view is supported by two observations. Firstly, there have always been community-level structures at the local level in fisheries in these three countries, though not always democratically elected. This is due to the population size at many fish landing sites, which can be in the thousands, meaning that a form of organisation is useful to government and others working with fishing communities. It cannot be concluded that an alternative form of local representation would avoid involvement in corrupt practices linked to illegalities. Secondly, the systemic nature of corruption within the three countries suggests that it would be ambitious to expect the fisheries sector to be immune from corruption. The example of how corruption and illegalities undermine co-management suggests that research on co-management should give greater attention to factors that may undermine the potential for success. Co-management systems and processes exist within a wider social, economic and political system, and, where often practices such as corruption exist, it is unlikely that co-management will be untouched and unaffected. This work was supported by the Leverhulme Trust under Grant RPG-2013-375, ‘Networking for fisheries co-management on Lake Victoria, East Africa’. The authors thank the fisherfolk and fisheries staff of Lake Victoria who participated in the research through lengthy interviews and accept all responsibility for the findings and conclusions presented here. The authors also thank the anonymous reviewers and IJC editors for their constructive comments. Agrawal, A (2003). Sustainable Governance of Common Pool Resources: Context, Methods, and Politics. Annual Review of Anthropology 32(1): 243–262. http://dx.doi.org/10.1146/annurev.anthro.32.061002.093112. Allison, E. H (2003). Linking National Fisheries Policy to Livelihoods on the Shores of Lake Kyoga, Uganda. LADDER Working Paper No. 9. Norwich: Overseas Development Group, University of East Anglia. Anders, G and Nuijten, M (2007). Corruption and the Secret of Law: An Introduction. Corruption and the Secret of Law: A Legal Anthropological Perspective. Nuijten, M and Anders, G eds. Aldershot: Ashgate Publishing, pp. 1–24. Carson, L. D and Prado, M. M (2016). Using Institutional Multiplicity to Address Corruption as a Collective Action Problem: Lessons from the Brazilian Case. The Quarterly Review of Economics and Finance 62: 56–65. doi.org/10.1016/j.qref.2016.07.009. Cepić, D and Nunan, F (2017). Justifying Non-Compliance: The Morality of Illegalities in Small Scale Fisheries of Lake Victoria, East Africa. Marine Policy 86: 104–110. DOI:10.1016/j.marpol.2017.09.018. Charmaz, K (2014). Constructing Grounded Theory. London: Sage. Cinner, J and Huchery, C (2014). A Comparison of Social Outcomes Associated with Different Fisheries Co-Management Institutions. Conservation Letters 7(3): 224–232. DOI:10.1111/conl.12057. Eggert, H and Lokina, R. B (2010). Regulatory Compliance in Lake Victoria Fisheries. Environment and Development Economics 15(2): 197–217. doi.org/10.1017/S1355770X09990106. Etiegni, C. A, Ostrovskaya, E, Leentvaar, J and Eizinga, F (2011). Mitigation of Illegal Fishing Activities: Enhancing Compliance with Fisheries Regulation in Lake Victoria (Kenya). Regional Environmental Change 11(2): 323–334. DOI:10.1007/s10113-010-0134-4. Etiegni, C. A, Irvine, K and Kooy, M (2017). Playing by whose Rules? Community Norms and Fisheries Rules in Selected Beaches within Lake Victoria (Kenya) Co-management.. Environment, Development and Sustainability 19(4): 1557–1575. doi:10.1007/s10668-016-9799-2. Evans, L, Cherrett, N and Pemsl, D (2011). Assessing the Impact of Fisheries Co-Management Interventions in Developing Countries: A Meta-Analysis. Journal of Environmental Management 92(8): 1938–1949. doi.org/10.1016/j.jenvman.2011.03.010. Geheb, K (1997). The Regulators and the Regulated: Fisheries Management, Options and Dynamics in Kenya’s Lake Victoria Fishery. Unpublished D.Phil. Thesis. Falmer, Brighton: University of Sussex. Gezelius, S. S and Hauck, M (2011). Toward a Theory of Compliance in State-Regulated Livelihoods: A Comparative Study of Compliance Motivations in Developed and Developing World Fisheries. Law & Society Review 45(2): 435–470. DOI:10.1111/j.1540-5893.2011.00436.x. Hauck, M (2008). Rethinking Small-Scale Fisheries Compliance. Marine Policy 32(4): 635–642. http://doi.org/10.1016/j.marpol.2007.11.004. Hope, K. R (2014). Kenya’s Corruption Problem: Causes and Consequences. Commonwealth & Comparative Politics 52(4): 493–512. DOI: 10.1080/14662043.2014.955981. Jentoft, S (2000). Legitimacy and Disappointment in Fisheries Management. Marine Policy 24(2): 141–148. http://doi.org/10.1016/S0308-597X(99)00025-1. Kariuki, J (2012). Assessment of IUU Activities on Lake Victoria. SF/2011/12 Implementation of a Regional Fisheries Strategy for the Eastern-Southern Africa and India Ocean Region. Ebène, Mauritius: SmartFish Program, Indian Ocean Commission. Kjær, A. M, Muhumuza, F, Mwebaze, T and Katusiimeh, M (2012). The Political Economy of the Fisheries Sector in Uganda: Ruling Elites, Implementation Costs and Industry Interests.. DIIS Working Paper 2012:04. Copenhagen: Danish Institute for International Studies. Kuperan, K and Sutinen, J. G (1998). Blue Water Crime: Deterrence, Legitimacy, and Compliance in Fisheries. Law & Society Review 32(2): 309–338. DOI:10.2307/827765. Lake Victoria Fisheries Organisation (LVFO). People in Lake Victoria Fisheries: Livelihoods, Empowerment and Participation. Jinja, Uganda: Implementation of a Fisheries Management Plan, LVFO. LVFO. LVFO Nile Perch Fisheries Management Plan, 2015–2019 (NPFMP2). Jinja, Uganda: LVFO Secretariat. LVFO. Regional Status Report on Lake Victoria Bi-ennial Frame Surveys between 2000 and 2014. Kenya, Tanzania and Uganda. Jinja, Uganda: LVFO. LVFO. Fisheries Management Plan III (FMPIII) for Lake Victoria Fisheries 2016–2020. Jinja, Uganda: LVFO Secretariat. Lawrence, T (2013). Taking the ‘Co’ out of ‘Co-management’: The Deligitimization of Fishing Communities on Lake Victoria, E. Africa. Water Co-Management. Krantzberg, G and Grover, V. I eds. Boca Raton, FL: CRC Press, pp. 168–196. Medard, M, Van Dijk, H, Hebinck, P and Geheb, K (2016). Governance in a Beach Seine Fishery: A Case Study from Lake Victoria, Tanzania. Maritime Studies 15: 11. DOI:10.1186/s40152-016-0051-3. Mkumbo, O. C and Marshall, B. E (2015). The Nile Perch Fishery of Lake Victoria: Current Status and Management Challenges. Fisheries Management and Ecology 22(1): 56–63. DOI: 10.1111/fme.12084. Muhumuza, W (2016). The Politics of Anti-Corruption Reforms and Reversals in Uganda’s Changing Political Terrain. Economic and Political Studies 4(1): 62–84. DOI: 10.1080/20954816.2016.1152095. Napier, V. R, Branch, G. M and Harris, J. M (2005). Evaluating Conditions for Successful Co-Management of Subsistence Fisheries in KwaZulu-Natal, South Africa.. Environmental Conservation 32(2): 165–177. DOI:10.1017/S0376892905002195. Njiru, M, Van der Knaap, M, Taabu-Munyaho, A, Nyamweya, C. S, Kayanda, R. J and Marshall, B. E (2014). Management of Lake Victoria Fishery: Are we Looking for Easy Solutions?. Aquatic Ecosystem Health & Management 17(1): 70–79. Nøstbakken, L (2008). Fisheries Law Enforcement – A Survey of the Economic Literature. Marine Policy 32(3): 293–300. https://doi.org/10.1016/j.marpol.2007.06.002. Nunan, F, Cepić, D, Mbilingi, B, Odongkara, K, Yongo, E, Owili, M, Salehe, M, Mlahagwa, E and Onyango, P (2018). Community Cohesion: Social and Economic Ties in the Personal Networks of Fisherfolk. Society and Natural Resources 31(3): 306–319. https://doi.org/10.1080/08941920.2017.1383547. Pomeroy, R. S, Katon, B. M and Harkes, I (2001). Conditions Affecting the Success of Fisheries Co-Management: Lessons from Asia. Marine Policy 25(3): 197–208. DOI:10.1016/S0308-597X(01)00010-0. Pomeroy, R, Parks, J, Reaughflower, K, Guidote, M, Govan, H and Atkinson, S (2015). Status and Priority Capacity Needs for Local Compliance and Community-Supported Enforcement of Marine Resource Rules and Regulations in the Coral Triangle Region. Coastal Management 43(3): 301–328. http://dx.doi.org/10.1080/08920753.2015.1030330. Punch, K (2014). Introduction to Social Research: Quantitative and Qualitative Approaches. 3rd edition London: Sage. Raakjær Nielsen, J (2003). An Analytical Framework for Studying: Compliance and Legitimacy in Fisheries Management. Marine Policy 27(5): 425–432. http://doi.org/10.1016/S0308-597X(03)00022-8. Sandström, A, Crona, B and Bodin, Ö. (2014). Legitimacy in Co-Management: The Impact of Preexisting Structures, Social Networks and Governance Strategies. Environmental Policy and Governance 24(1): 60–76. 10.1002/eet.1633. Sen, S and Raakjær Nielsen, J (1996). Fisheries Co-Management: A Comparative Analysis. Marine Policy 20(5): 405–418. doi:10.1016/0308-597X(96)00028-0. Sundström, A (2012). Corruption and Regulatory Compliance: Experimental Findings from South African Small-Scale Fisheries. Marine Policy 36(6): 1255–1264. http://doi.org/10.1016/j.marpol.2012.03.013. Sundström, A (2013). Corruption in the Commons: Why Bribery Hampers Enforcement of Environmental Regulations in South African Fisheries. International Journal of the Commons 7(2): 454–472. http://doi.org/10.18352/ijc.370. Sundström, A (2015). Covenants with Broken Swords: Corruption and Law Enforcement in Governance of the Commons. Global Environmental Change 31: 253–262. http://doi.org/10.1016/j.gloenvcha.2015.02.002. Sundström, A (2016). Corruption and Violations of Conservation Rules: A Survey Experiment with Resource Users. World Development 85: 73–83. http://doi.org/10.1016/j.worlddev.2016.04.011. Transparency International.. What is Corruption? Transparency International, http://www.transparency.org/what-is-corruption#define. Accessed 28th November 2016. Transparency International – Kenya. The East African Bribery Index 2014. Nairobi: Transparency International Kenya. Williams, A and Le Billon, P (2017). Introduction. Corruption, Natural Resources and Development: From Resource Curse to Political Ecology. Williams, A and Le Billon, P eds. Cheltenham: Edward Elgar, pp. 1–13. Yin, R. K (2014). Case Study Research: Design and Methods. 5th edition Thousand Oaks: Sage.